The only thing better than a movie couple is when the actors are even better friends off set, than on. 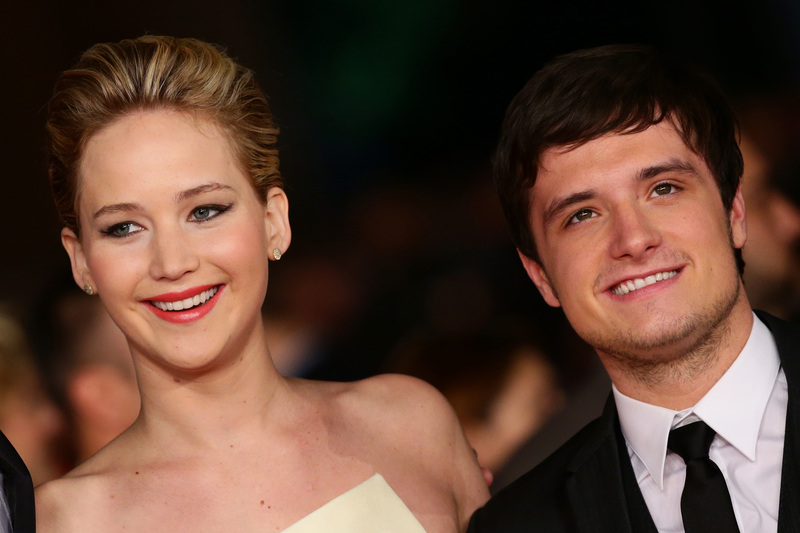 There's no better example of those kind of best friends than Mockingjay's Josh Hutcherson and Jennifer Lawrence. They're the kind of BFFs who can go do their own thing, like when Hutcherson worked on filming Paradise Lost, but when the reconnect, they're better than ever. There may have been a hint of mistrust in Peeta and Katniss' relationship at the start — after all, Katniss was convinced Peeta was befriending her just to kill her later — but in real life Hutcherson and Lawrence had an instant bond. Both hailing from Kentucky, they were destined for friendship. In fact, J. Law says it was Hutcherson who helped her stay in the acting business long before he even knew her. Is that not the cutest story ever? But there's way more adorableness where that came from. I could seriously probably write a 100-item list on why they're the best of friends, but I won't do that to you. So instead here's a condensed version featuring nine of their best BFF moments. J. Law adorably describes the impression Hutcherson left on her when they met for a Hunger Games reading. "He’s charming and nice and sweet, like a dog licking your face," she told MTV. It's an odd compliment for sure, but that's the way their friendship works, it's totally random and hilarious and the two of them together ignite the whole room. It's so sweet when Hutcherson is doing press separately from J. Law but he still manages to sneak in some compliments. "She's incredible," he once said of working with her, and another time he remarked on her acting skill saying, "The fact that she can go from doing an Academy Award-winning movie to X-Men to Hunger Games. Just, like, the versatility is inspiring.” No, your friendship is inspiring. Hutcherson admitted that during filming for Catching Fire in between takes the two would make plans to "meet at craft services and get some Cool Ranch Doritos." That's my kind of friend. That rash comment will go down in history as the best thing to say on a red carpet, ever. Only true friends are allowed to embarrass each other in front of the media. J. Hutch was asked what he'd rate J. Law's kissing skill and he gave her a 12 out of 10. He also admitted that she was his first big movie kiss. No one better to break that ground with than your best friend, right? How I Met Your Mother taught me that high fives are the ultimate form of friendship. Lawrence wasn't kidding when she told MTV, "We always play off each other." Click any interview of them on Youtube and prepare to laugh, because the J. Law/J. Hutch combo is hilarious. What better way to end this list than with the factoid that these two adults would run around the set pretending to be kittens together with their hands poised as paws. I mean, if that doesn't say "best friends forever" I don't know what does.